Have you ever vacillated between solutions only to make no decision at all? Or have you made a choice so fast that you didn’t even look at more ideal options because you just wanted to move forward with your project or business? The truth is, solutions abound on all topics. And within that buffet of choices lies the most ideal choice ever… for you. The catch? You have to be willing to push your chair back from your desk and take a time out. Solutions will bubble up at a rapid pace if you allow them. 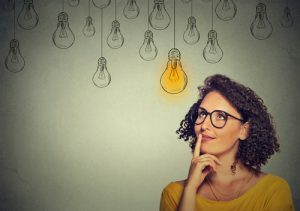 Daniel Burrus, who wrote Flash Foresight, puts it this way, “When you look in the opposite direction from where everyone else is looking, you see things nobody else is seeing.” I like this perspective because often it can seem like you’re thinking outside the box but you’re still trying to create a solution from inside the problem. Another reason why it can be challenging to nail down your ideal solution or a super fab idea is that you are trying to attack the symptom. You have to go way beyond that. Susan wanted to upgrade her website. It was outdated and pieced together in a haphazard fashion. Her focus was to generate extra income so that she could hire someone to make the changes. She began to think of ways to make money fast… $3,000 to be exact. If she had kept that focus, she would’ve eventually saved up the money, and her new website would be up for public viewing. But is that what she really wanted? No. Not really. As Susan took a pause for the cause, she got to the real desire. She wanted to remodel her website, and hire someone to make the changes and do the day-to-day maintenance. She also wanted to generate more than an extra $3,000. She needed to uplevel her yearly income by $50,000. The solution to that desire would be very different than a solution for creating an extra few thousand. The problem was that if she knew how to create the additional $50,000, she’d already be doing it, right?! Susan and I began the brainstorming process with one of my favorite games, “What If UP.” We threw out logic and her history. Could get a single big contract vs. dozens of smaller ones? Doubled or tripled her current fee structure? Made friends with some BIG dogs in her industry and they promoted her work to their fans? Created a whole new program in an area of her expertise and generated $100,000? Let go of her past struggles and considered herself the rock star of her industry? What would she do different? Do you see how this line of thinking opens Susan up to completely new territory? You have to get wild and crazy in your mind. Go beyond your immediate needs and focus on ideal targets, not what will just get you relief. Go beyond what you have experienced or are familiar with in your business. Have some fun and be outrageous. You WILL attract your most perfect solution. Trust the process, and trust yourself to carry out the ideas.